South Korea’s top nuclear envoy on Monday headed to the US, where he is expected to launch a working group with his US counterpart aimed at better coordinating their North Korea policy, amid ongoing efforts to rid the Korean Peninsula of nuclear weapons. 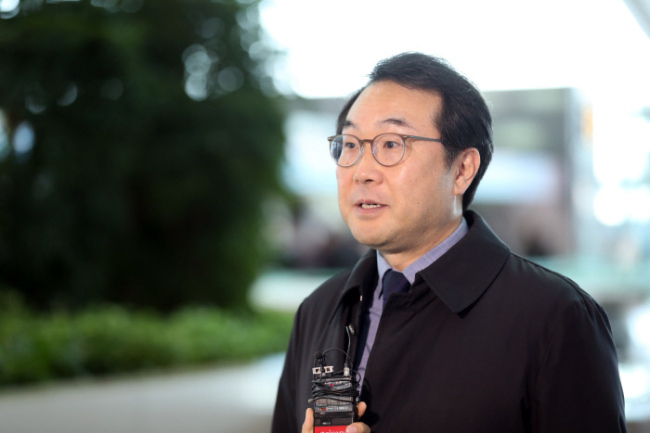 Lee Do-hoon, Seoul’s special representative for Korean Peninsula peace and security affairs, is to discuss the two countries’ shared strategy to deal with North Korea with Stephen Biegun, the US special representative for North Korea, during his three-day visit to Washington. They are expected to launch the working group aimed at maintaining close coordination on North Korea’s denuclearization, the implementation of international sanctions against the North and inter-Korean cooperation, and possibly hold its first meeting. Accompanying Lee are officials from the Unification Ministry and the presidential office. “There has been close coordination about upcoming negotiations between the US and North Korea,” he said, adding they continue to update each other about new developments. High on the agenda at the first meeting of the working group is expected to be the two Koreas’ plan to hold a groundbreaking ceremony and a joint study for connecting railways across the inter-Korean border -- a result of the inter-Korean summit in April. South Korea has asked the US to give the North sanctions exemptions for the project, after the United Nations Command, which oversees the Demilitarized Zone at the inter-Korean border, did not permit South Korea’s request to test run train across the border in August. South Korea seeks to improve inter-Korean relations and expand cross-border projects, but the US is cautious about the fast pace of inter-Korean developments without tangible progress on the North’s denuclearization. Lee and Biegun are also expected to discuss the prospect of high-level talks between US Secretary of State Mike Pompeo and his North Korean counterpart, Kim Yong-chol. Their meeting was set to be held on Nov. 8 but was postponed at North Korea’s request, which sparked speculation that differences between North Korea and the US over who should make a concession first to move forward on denuclearization talks were too big to be narrowed. Recently, there have been signs of preparations for high-level talks between Pompeo and Kim. Andrew Kim, head of the Central Intelligence Agency’s Korea Mission Center, was in South Korea from Wednesday to Saturday to hold talks with South Korean officials in Seoul, as well as North Korean officials in the border truce village of Panmunjom. The four-day visit by Kim, who played a key role in preparing for the June summit between US President Donald Trump and North Korean leader Kim Jong-un, is seen as part of efforts to pave the way for the high-level meeting between Pompeo and his North Korean counterpart. North Korea has expressed its discomfort about Seoul and Washington establishing the working group. Uriminzokkiri, a North Korean propaganda website, earlier denounced the plan as Washington’s “arrogant intervention” in inter-Korean relations and Seoul’s “shameful” act.